Genre/Influences: New-wave, gothic, punk, electro-pop, dark-electro, wave-pop, future-pop, EBM. Background/Info: I couldn’t resist reviewing this artistic double vinyl compilation featuring 20 international bands dealing with varied, but related music genres. This compilation released in 2016 (!) 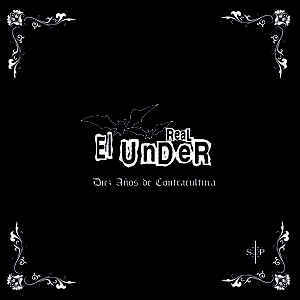 is a celebration of the 10th anniversary of the Mexican organization “El Real Under”. This organization is totally devoted to the ‘underground’ music and brings parties and concerts. Sector Industrial Producciones is driven by Dimitri Berzerk. This vinyl was the first release from the label. Artists: Carcrash International, Simi Nah, Attrition, Sigue Sigue Sputnik, Apoptygma Berzerk, Cid Project, Trans-X, State Of The Union, Shiv-R, C-Lekktor, Larva, Tobias Bernstrup, Sturm Café ao. Content: The tracklist is absolutely impressive, revealing a wide diversity of bands and music styles, but still a very international selection of bands and artists from the early new-wave years (Carcrash International, Sigue Sigue Sputnik, Trans-X, Attrition…) and contemporary leading formations (Apoptygma Berzerk, C-Lekktor, Shiv-R, Sturm Café…). The tracklist is composed by exclusive tracks and songs that have been featured for the very first time on vinyl. I’ve to say that several ‘exclusive’ songs are remixes. + + + : You just need a brief look at the tracklist to realize this compilation is featuring real great names, but the diversity of the artist is also worthy of examination. 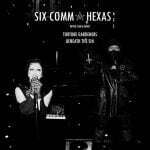 From 80s legendary formations dealing with new-wave and wave-pop to great electro-pop to pure EBM to powerful dark-electronics to future-pop (with a Spanish cover of VNV Nation’s “Honour” by State Of The Union) this album is filled with numerous great surprises. Another essential element is the ultra artistic artwork of this release featuring 2 picture discs. – – – : I’ve been just less convinced by a few (I guess) Mexican formations dealing with poorly inspired punk music, but which are probably renowned and respected in their homeland. Another and very personal regret is that the informative booklet is only written in Spanish. Conclusion: This is a great compilation and I also have to recommend you to discover the Mexican label Sector Industrial Producciones. Best bands: Simi Nah, Cid Project, Trans-X, Shiv-R, The Ancients, C-Lekktor.